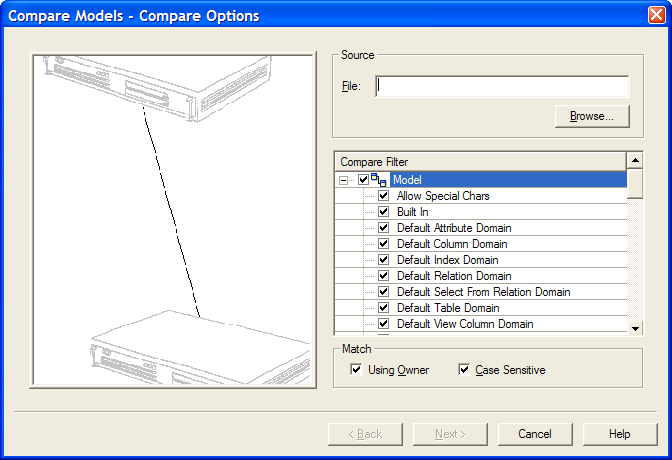 1.Select Model > Compare with Model from the menu , or select from the Modeling Tasks section of the Shortcut Toolbar to start the Compare with Model wizard. •Compare Filter: specify the types of objects and properties that you want to compare. •Match Using Owner - after ModelRight loads the target Model, it needs to match up Tables (and Views, etc...) in the source Model with Tables in the target Model. If this option is selected, then a Table's owner must match as well as the Table's name before ModelRight will automatically match them. •Match Case Sensitive - if selected, then the case of the names of objects must match before ModelRight will match the objects. 5. 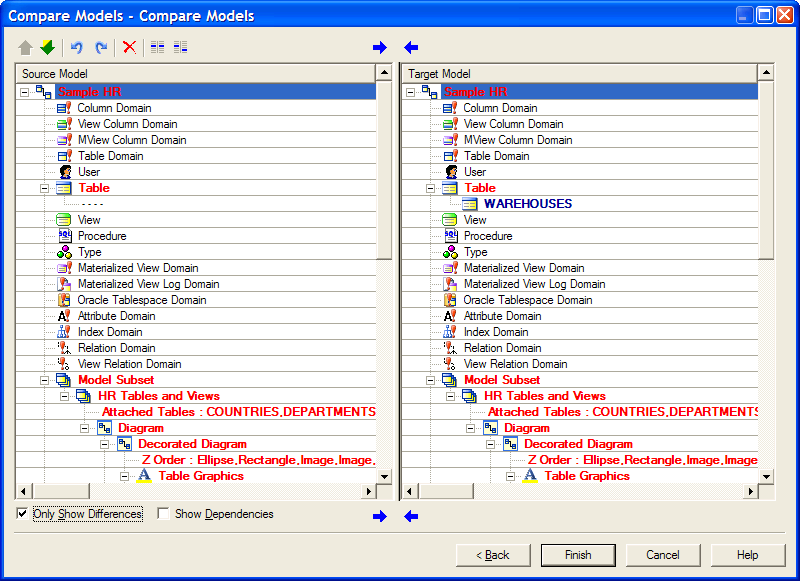 This wizard page shows the differences between your source and target Models. ModelRight will save any changes that you make to the target Model if you click Finish. - export or import a difference. Use the import button to import an object(s) or property into your current Model. When you import an object/property, the action is performed immediately and the comparison trees will be updated immediately with the result(s). Of course you can use the Undo/Redo toolbar buttons that are on the page to undo/redo any changes. Use the export button to export any source Model object or property to the target Model. If you export an object/property, the action is performed immediately on the target Model and the comparison tree updated to reflect the result. - manually match or un-match objects. If ModelRight doesn't automatically match two objects that should be matched (probably because their differences in their names), then you can do so manually. Simply select one of the objects, hit the match toolbar button and select the other object that you want to match. To un-match tow matched objects, select the matched items and hit the un-match toolbar button . Only Show Differences - if selected, then items that match and are equal are not displayed. Show Dependencies - shows all the referenced objects that an object depends on. In some cases, importing/exporting an object's differences will not fully resolve a difference unless its referenced objects are first imported/exported. Selecting this option will cause unresolved dependencies to be displayed under objects in the tree so that you have a visual cue to help you determine what needs to be imported/exported to resolve differences.